One of the ProActive Web Solutions areas of expertise is law firm web design and law firm web development. 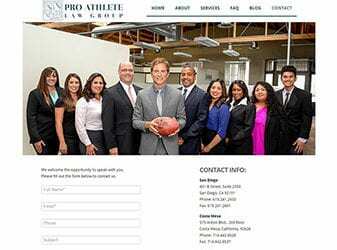 We have built dozens of law firm websites, for small and medium sized firms around the country. Our depth and breadth of knowledge about web design, web development, and the fundamentals of internet marketing, make us a valuable resource for all of our clients – especially those within the legal profession. Not only do we incorporate cross-device responsive design into our law firm websites, but we couple this with custom design to create a truly unique and user friendly experience. Never miss a chance to provide information to your clients or capture a new client lead again. Our websites are also easy to manage after launch. Not only will you always have our team as a trusted resource, but we will provide you with the tools to update your website on a regular basis.